On Wednesday, Michigan offered 3* Wide Receiver Theo Howard. Howard is a very under-rated receiver in my mind. After watching his highlight film, it’s very easy to see that Theo possesses great hands and does an excellent job of catching the ball with both hands. He’s not necessarily the fastest runner I've ever seen but, he does have more than adequate speed for the college level. He does an excellent job of keeping his legs moving while trying to be tackled, which results in extra yardage. I think Theo could be an excellent slot receiver at the next level, just not a #1 receiver unless he bulks up quite a bit. Theo has also had the benefit of playing with an exceptional Quarterback in Malik Henry, who Michigan has also offered a scholarship too. Michigan became Theo's third scholarship offer; joining San Diego State and Washington State. In 2013, Theo posted 408 receiving yards with 6 touchdowns. · OL Jon Runyan Jr.
· LB Darrin Kirkland Jr.
s Who else could possibly join them? There’s no doubt that KLS is atop the wish list of the Michigan coaching staff. With Frank Clark and Brennan Beyer leaving after this year, the Wolverines are only left with five defensive ends on the roster. In my opinion, there is no better prospect to fill this need than Keisean. Although he has switched to a 3-4 OLB this year for his Lutheran High School team, there’s no doubt that he could return to a defensive end position for college, which is where Michigan has been recruiting him as. Keisean will be in attendance October 11th, when the Wolverines take on Penn State in UTL 3. Keisean is currently ranked as the #3 OLB and #30 overall according to Rivals. Son of former Michigan great, Tyrone is an excellent tight end prospect. Although his offensive numbers don’t exactly jump off the page, Wheatley Jr. has all the makings to be a big time college contributor. Currently ranked as the #10 TE, and #231 according to 24/7’s composite rankings, Wheatley is being recruited as an ATH by the Michigan coaching staff. Having Chris Clark already committed to play Tight End, Tyrone could see playing time on both sides of the ball during his college career. Michigan will have to fight off Alabama, USC, UCLA and Miami for his services, but in the end I think he ends up in Ann Arbor. Wheatley had 16 receptions for 190 yards and 2 Touchdowns in 2013. He also saw playing time at Defensive End registering; 41 tackles, 14 for a loss, 2 sacks, 4 forced fumbles and an interception. To view Tyrone’s Hudl highlights click here. Grant Perry is a name I've been wishing the coaching staff would offer for months now. He’s an excellent wide receiver, who already has chemistry with 2015 commit Alex Malzone. Perry is a proven winner as his Brother Rice High School squad has won three straight state championships. Although he’s not the fastest kid on the field, Grant does an excellent job following blocks allowing for him to gain the most yards possible. He does an excellent job of getting open, allowing for Alex to find him in open space. He’s doesn't possess the most blazing speed, but he does run fast enough to play Wide Receiver at the next level. He does an excellent job of catching the ball with both hands and cradling the ball into his body. If the coaching staff were to finally offer Grant, I believe he would commit instantly and become the newest member of Team 135. 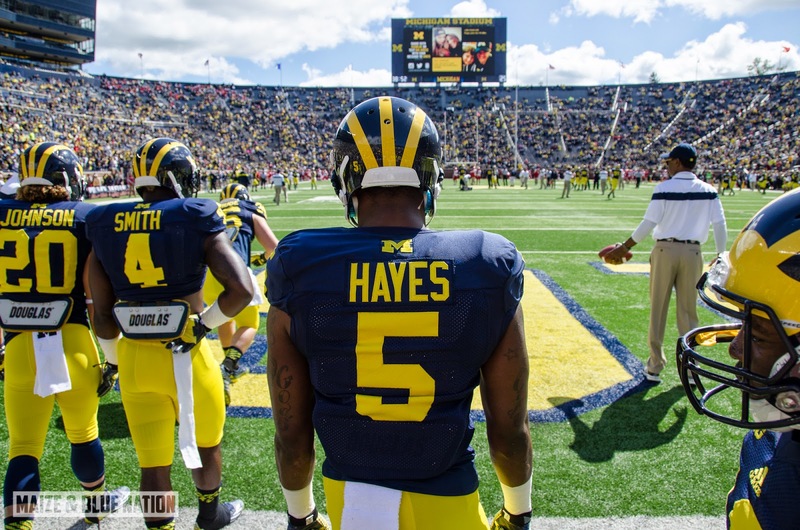 Lewis has long been linked to the Wolverines ever since his decommitment from Florida. He has all the tools college coaches dream about. He has the perfect size (6’1, 190 Lbs), and is fast enough to go up against big time receivers (40 Time: 4.38.) He does an excellent job of lowering his shoulders while tackling. Seeing playing time on offense,defense, and special teams, it’s easy to see why Marcus is one of the most wanted defensive backs by college coaches. Lewis visited Ann Arbor last summer for The Big House BBQ, and plans to announce his college decision on National Signing Day. Recently, Lewis said that Michigan leads for his services, followed by Miami and Oregon. 2016 OL Thiyo Lukusa will visit Ann Arbor this weekend to watch the Wolverines take on the Minnesota Golden Gophers. Thiyo currently holds a 24/7 crystal ball reading that favors Michigan 82%. 2016 WR/S Stefan Claiborne will also be in attendance this weekend for an unofficial visit. Stefan has yet to see a Michigan offer come his way, but that could all change after his visit this weekend. Claiborne is currently ranked as the #4 safety, and #54 overall according to the 24/7 composite rankings. 2017 DE Corey Malone-Hatcher will be making his second appearance at The Big House, in as many weeks. Corey is an absolute beast on the defensive line, and is a prospect I hope Michigan offers soon. Come 2017, Malone-Hatcher will be one of the most sought after defensive prospects and it’s integral that the Wolverines keep up their recruitment of the in-state product. Corey only has one offer according to 24/7 sports, and that comes from Ohio State. 2015 CB Tyrone Miller is making his second trip to Ann Arbor since June. Currently unranked by Rivals, Miller holds a scholarship offer list including mostly MAC schools. 2016 DT Blake Roe is also unranked by Rivals and does not have any scholarship offers at the moment. 2015 RB commit Mike Weber will receive his U.S Army All-American Jersey tonight during half time when Detroit Cass Tech takes on Denby High. Mike had to miss last game due to a toe injury he suffered in the second game of the year. 2015 DE commit Darian Roseboro is visiting North Carolina State this weekend for an official visit. Cue the twitter meltdown. However, on Friday morning Darian had an encouraging tweet for Michigan fans. 2015 #Michigan DE commit Darian Roseboro RT "@DarianRoseboro Just cause I'm on a official doesn't mean anything"
Personally, I think Roseboro sticks with him commitment to the Wolverines.